Owners and player representatives called a Tuesday meeting "productive" but didn't announce any new policies. 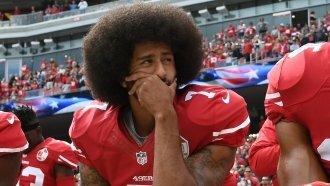 NFL owners and player representatives talked for more than three hours Tuesday to try and resolve the ongoing controversy over national anthem demonstrations by players protesting police brutality. No official agreements were reached. In a joint statement, the NFL and the NFL Players Association said they were working together "to promote positive social change and address inequality in our communities." The statement said they're trying to "find common ground." The NFL has already said it wouldn't force players to stand during the anthem. But NFL Commissioner Roger Goodell says he thinks players should stand during the anthem. He wants the league to "move past" the controversy. Absent an NFL rule change, it seems unlikely the controversy will entirely go away without a joint agreement from the players. As recently as Sunday, some were still taking a knee.